Roger S. Gottlieb is internationally known for his groundbreaking studies of religious environmentalism, passionate account of spirituality in an age of environmental crisis, and enlightening vision of the role of religion in a democratic society. 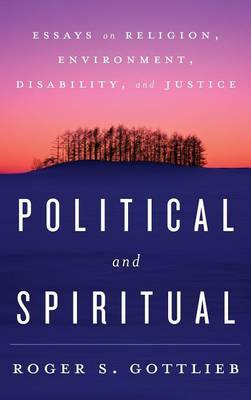 Political and Spiritual brings together for the first time his most powerful essays on these and related themes. The book's wealth of topics includes spiritual deep ecology, ethical theory, animal rights, the Holocaust, the environmental crisis, and the experience of disability-as well as new essays on the human meaning of technology, facing death, and a fascinating intellectual autobiography. As a whole, Political and Spiritual reveals Gottlieb's unique ability to connect our collective struggles for a just, rational, and caring society with our personal strivings for contentment, wisdom, and compassion.